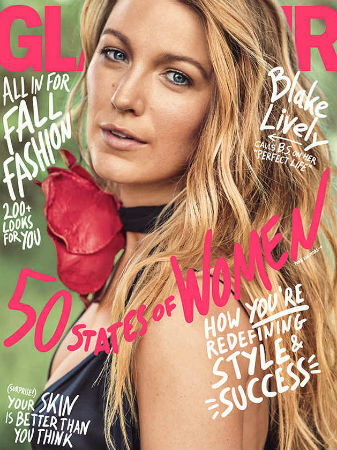 -What exactly is Blake Lively promoting right now that landed her the cover of the Sept issue of Glamour? Why is she only wearing one dress in almost all of the photos? Why is her rose choker so big? Sadly, none of these pressing questions are addressed in the interview, in which she talks about how her life isn’t perfect, how the election “awakened” her to be “more aware, more conscious, more sensitive,” and how she deals with sexist scripts. –Macaulay Culkin and his goddaughter, Paris Jackson, got matching spoon tattoos. -RIP Sam Shepard, who passed away at 73. -Well this is terrifying: Kate Beckinsale’s stalker was arrested at Comic Con. -I’m weirded out that every Game of Thrones fan I follow on Twitter seems to suddenly be shipping Daenerys and Jon Snow (and not just because they have the chemistry of wet cardboard). -Meanwhile, Game of Thrones star Nikolaj Coster-Waldau is suing his former manager over alleged deception. -It’s been a rough weekend for HBO. First, the #NoConfederate hashtag trended so hard last night they had to release a statement, and then they got hacked and Game of Thrones spoilers have leaked online. What’s even scarier, the hackers claim to have stolen 1.5 terabytes of data from the company, which means we might get a Sony-level release of emails and employee info soon. -Just in case you needed more reasons to watch Insecure (which you shouldn’t because it’s great), Regina Hall and Scott Foley headlined the fictional show-within-the-show in last night’s episode. -I gotta wonder why Ben Affleck would even agree to pose for a photo with a fan in a liquor store? -Post-Wonder Woman DC is not looking so great. Suicide Squad 2 hasn’t had a director since at least December of 2016. -It’s going to be a tennis-heavy TIFF. Besides Emma Stone’s Battle of the Sexes, Shia LaBeouf’s Borg/McEnroe is set to open the festival. Here’s the first trailer. -Here’s the first cryptic teaser for Darren Aronofsky and Jennifer Lawrence‘s Mother!